Quote Reply Calendar Event: EAST TX AMC CRUISE-IN, JUNE 1, 2019, 8TH ANNUAL! This has been described as the most comfortable car event most folks have ever attended. We'll have plenty of sun and plenty of shade, cars are parked on grass, not hot pavement (unless we have to substitute the event location due to weather, which thankfully hasn't been required yet), plenty of good food, plenty of good friends, plenty of good cars and Jeeps, plenty of parts, this is the AMC place to be in June. Last year our swap meet area was again packed with parts and there are no vendor fees. Hagerty Insurance was in attendance again to offer lots of valuable advice and give quotes to our attendees (and some great freebie items ; ). There is a possibility that we will have some live entertainment this year, though there are several factors that will dictate that in the final run-up, but fingers crossed it won't all be music from cd's this year, stay tuned for developments. We look forward to seeing all our old friends and making new ones too. More details and our show flyer will follow. '74 Javelin 401 very late (the last?) built. Reagan is right on my friends, you will be had pressed to find a more enjoyable car event. AMC people, good food, millions of dollars (more or less) worth of door prizes. Now possibly live music ??? Rock on in the AMC World !!!!!!! Thanks for jumping in with a reply Ollie. We look forward to having you and Teresa back again this year. Folks, if you haven't met this couple they are the Road Warriors of the AMC world and represent the faithful all over the country throughout the year. We're certainly glad y'all have made the ETCI a must attend event each year. A thanks goes out again this year to Janice Taylor for the assist in getting the event flyer together. Please feel free to print off copies and circulate them to help spread the word for our event. I've inserted the flyer at the bottom of this posting. 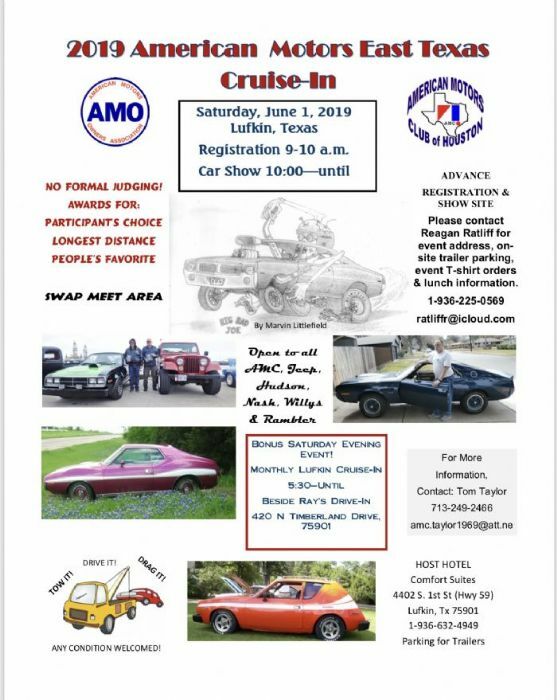 Please note, this we have two events in one day this year in Lufkin, as our event coincides with the monthly Lufkin Cruise-In night beside Ray's Drive-In, located at 420 N Timberland Drive, 75901. We'll likely wrap up the ETCI around 3:30 or so, which will give folks a couple of hours to explore Lufkin some more or hit the hotel room for a nap before this free cruise-in gets going around 5:30 and goes until folks finally leave, sometimes 10:00 or even later. Ray's is a classic drive-in that has been in business since the 1950's and has a car themed interior, actual car hops if you prefer to have the full drive-in experience or even deck seating that overlooks the cruise-in. I'm hoping we have some folks that will want make both events for the day so we can further represent the red, white and blue in good numbers at this multi-make event and have some good exposure for our classics. Remember folks, this is an any condition welcome event, so Drive It!, Drag It! or Tow It! Just because you think "Aw, it's just an ugly project right now" doesn't mean folks don't want to see it. There is as much appreciation for these as there are fully restored vehicles and there is no judging, so bring them out and share them. We've had a family help their son bring his project over that had no motor or transmission in it. They trailered it, pushed it off the trailer and out onto the lawn. He was even able to get some needed parts and make sure they were the right ones because his project was right there. Keep in mind that if you are unable to bring your vehicle, but have some spare parts that need a new home, this is the venue to bring them to. If you know you'll be bringing some parts or are going to be attending and are in need of some parts, please post those here so others that will be attending can see. I'm attaching the event registration form below. If you plan to attend let me know as soon as you can, as we need to establish our headcount for lunch prep, etc. If you are planning on trailering a vehicle let me know so I can start planning out the parking/unloading for those. We've had some folks already talking about parts they are needing and ones they'll be bringing for sale/swap, so if you have some specific parts needs or know some of the things you'll be bringing, please post them here and/or send them to me via e-mail and I'll get the request out to the over 200 folks that receive my AMC/Jeep e-mails. More info to follow soon, I hope everyone has a great weekend.